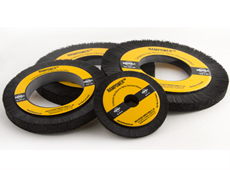 Brush Research's Composite Hub Radial Coil Wheels feature a higher filament density for longer brush life, indestructible cores and superior balanced construction. 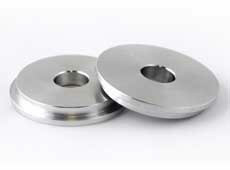 Typical applications include: edge radiusing, turbine blades, gears, machined parts, cam shaft and cutting tool inserts. 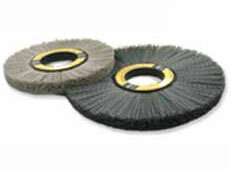 Learn more about our radial wheel brushes by contacting us today. Brush Research produces machined arbor adapters in a variety of sizes for Composite Hub Wheels. These adapters are designed to offer increased brush support, less brush vibration and longer brush life. Designed to adapt our composite wheels to standard arbor shaft sizes including 1/2", 5/8", 3/4", 7/8", 1", 1-1/4" and 1-1/2". Price includes 2 adapters.